They say that parenting is like dancing. You take one step, your child takes another. They say "never say never". They also say no book nor class can ever prepare you for motherhood and raising kids. But reading mommy blogs and talking to my mommy friends made me also realize that it is a deliberate decision how you want to talk to or act around your kids. Not just an instinct-driven choice. And it inspired me to write this post. I salute all mothers who use all their willpower to control their temper and not lose their ish when things go really loud and wild inside the house. It's funny how they write about their experiences, but I'm sure it's not funny at all when chaos happens. You are all real heroes! I will never compare my kids with another, even with their siblings. I'm sure some parents mean well and think that comparing their kids would motivate them. But the subliminal message of comparing is: "You are not good enough". Or "unless you be like or be better than this kid, you will never get my approval." I will, through God's grace, make it clear to my children that they are beautiful and worthy of love. They may have to change and improve some areas in their lives but that is part of growing and coping. The only person they need to compete with is themselves. The only record they need to break are their own. They must know that they are loved by me and by God exactly the way they are. I will never laugh at my children's dreams and mistakes. They may go through a stage where they will have crazy big and even silly dreams (my friend's son wanted to make finding spiders in the woods a profession when he was around five), but they will either outgrow them or they would know better soon enough. Besides, isn't that what being a child is all about? Working with your creativity and seeing the world with wonder? For children, anything is possible because no one told them yet otherwise. And I believe we should never stop encouraging them from honing their creative side. Children are bound to make mistakes because that's how they'll grow and improve. There's nothing to be embarrassed about. The important thing is that they learn from it. We all had one ridiculous dream when we were kids. We all made mistakes. We all are still making mistakes. But we all turned out okay, right? I will never make my children feel alone as long as I'm there. The worst kind of loneliness is feeling alone while you're surrounded by people. I vow to make my children feel secure, loved, and cared about as long as I'm alive. Maybe even after that. I want them to know that they can always count on me to be there, to listen without prejudice or criticism. They will always have a place to come home to, and that someone's there waiting for them and ready to welcome them with a hug no matter where they've been or how long they've been gone. Having encountered different kinds of people from school to work, I've realized that the reason many kids feel lost and take the wrong path so to speak is because they don't have a sense of belongingness. They don't know who to turn to when things go wrong. They don't have a home to welcome them where they'll feel safe and loved. I will never shelter them from reality. Some children grow up as brats because that's the way they were raised. Their parents managed to block the truth from them and filter the negativity. Of course it's natural for parents to be protective but we should never underestimate the children's understanding and wisdom. I think exposing them to the truths in life earlier will make them open-minded, cautious and empathetic. Example, bring them to outreach programs, let them see that poverty is real, educate them about the state of the planet or how cruel some people could be to animals and people. They must know that not everyone they meet have good intentions. Friends may betray them. Some people are broken and it's not their job to fix them. They have to know that a rose may be beautiful but it also has thorns that can prick if they're not careful. I will never shame them especially in the public. Shaming your kids in public (or even in private) is the same as taking away their self-esteem, making them question their self-worth and killing their self-respect and dignity. One time I was dining out with my sister and 3 tables away from us is a mother chastising her teenage daughter, calling her stupid repeatedly. They seemed unaware that all eyes and ears were on them. Who knows how long that girl would carry the label "stupid" around and live up to it? I will never stop sharing my faith with my kids. I will introduce them to Jesus, make Him real to them, talk about Him like He's some cool friend they could always run to and follow as an example. The reason why most people don't feel a connection with God is because they see Him as a distant, cruel king sitting at his throne the whole day waiting for someone to punish. They don't know that Jesus will never condemn them (John 8:11). God loves them more than they could ever comprehend (John 3:16). And that His love for them is always fresh (Lamentations 3:22). Not just crumbs or leftovers from yesterday but always whole and new. With these guidelines, by God's grace, with support from the people around me, reading mommy blogs all the more, and lots and lots and LOTS of trial and error, I think I can manage to raise children well enough. Those are all wonderful things, greetings and best wishes! PREACH!!!!!! Number one most especially. I don't know.. I'm in such a weird space right now ... I used to be so so broody.. hell, I tried for babies.. it just didn't happen. Now I'm taking a break from dreaming of kiddies. I have a nephew and he's out of this world wonderful even though he's approaching the Terrible Twos. But that's really all I need. My nephew - then give him back and do whatever I want to with my life!!! Do other ladies have this stage???? I don't know where it came from and it's worrying a little.. not going to lie! All great advice. You're a good mother. Thanks for your points. I do believe there are appropriate times and ways to introduce kids to reality. I certainly think letting kids see poverty as they take food to a food pantry or reach out in some other way is good. I don't think kids need to be exposed to every bad thing as early as possible. For example, I don't teach them about every kind of sickness or every way you could die now. However, when someone they know gets a type of sickness or dies, we talk about what happened. We pray for sick people together. Such a beautiful article Lux! I really hope you succeed. Parents didn'ty think like you do fifty years ago. Dear Lux, you possess wisdom far beyond your years. You are a Michael disciple as well as a Jesus disciple. You will make a wonderful mother. The world needs more like you. I totally agree with your six parenting rules. They offer very important advice that I wish more parents would follow. The first and second points are the most important, while the third is the most difficult to do. There's a fine line on being detached and overattached. The latter might even spark some conflict. Great tips Lux! All very true but your number one is my number one, too. Parents have no idea how much harm they do when they compare children to one another. Not only does it damage the child it damages the relationship of the child and the child they are compared to. As a parent at the elder end of the age spectrum, I believe the best question you pose here is this: "Besides, isn't that what being a child is all about? Working with your creativity and seeing the world with wonder?" So important to let children learn to solve problems and meet challenges by their own efforts with confidence and compassion. Protect them, guide them, accept who they are --learn from them. Beautifully stated. You're a great mom. I made lots of mistakes with my girls, but thank God, He forgives. And I'm working on their forgivesness. Ooops, forgot to say, here from Monday Madness. The only comment I have is that I constantly compare my children. I have four. They are so much alike and so very different in other ways. But my comparisons are not mean-spirited. They are comments on family likenesses and individual differences. I do not say, "You should be more like your brother" for instance. It is more like, "Do you realize that all four of you have a generous spirit?" Am I wrong? Hi Lux. As usual you have shared words of wisdom. I will never stop believing in my Kids Dreams and in them.That's my favorite. Hi Lux! You really have some key guidelines here, I think you will be a wonderful mom! Never making your children feel alone is such a wonderful goal. Never be too busy to talk, always be in their corner... That's what creates a love-connection. No advice from me - ...i did raise 4 boys which was probably one of the hardest things I have done when they got in middle and high school . We definitely had issues with two of them and the friends they chose , etc.. I tried the best i could and I think my best was pretty good but certainly there were moments I would like to do different. They are all pretty good guys but do have their faults like we all do. This is completely true. I feel still very young to raise children. But before I do that, I want to be the best person, who is able to show them a good example. Thank again for very inspiring post. Totally agree with you, I would def do those things if I had kids. Mostly number 6! Wow what a wonderful list, I should save this, so true! Parenting is the most difficult task ever! Nice read! I like the point about not sheltering them from reality! Great read. From a distance, parenting looks easy. I know it's not, but, you know. Great post. I am raising just one daughter. I don't want her to feel alone either. It is hard in our circumstances. I also want her to see life in truth. Thanks for sharing this important list. Great post. Growing up in an abusive home, I always told myself that my kids would never be afraid of me. If anything, I can be too lenient, but I know what I feels like to live in fear and I will do anything to protect my children from that. Beautifully crafted post, Lux! I am happy to share that, I live exactly this way with my kids, and I am proud to be their friend and not a teacher ! Wonderful and important thoughts here, Lux! I especially love #6. I struggled with my faith when my kids were growing up. I regret terribly not standing stronger in that area for them. I'm working overtime on that one now :). and yeah NNe.. @"They don't have a home to welcome them where they'll feel safe and loved..." I feel there is no worse a feeling than not being wanted.. and the crowd goes.. Awwwwggghhhh.. I pray GOD helps us to make great parents.. Cheers Bubba.. This was a worthy read..
Eu também nunca vou fazer essas coisas com meus filhos! It's important to keep on top of your child's development to make sure they are developing on the right path. Great tips! Observing 0thers can teach you at least 6 things to never do in raising kids. I probably broke most of these one time or the other. I tried to not show partiality and our children knew if one got new shoes, theirs would come next pay day. I do remember taking them with me to visit some Sunday School children at the housing project. It was not a bad place, but so much worse than where we lived. I think it did give them a view of the way others live. We shared Jesus with them too, and they all turned out good. Thanks for such a wonderful list you are sharing with us here at Tell me a Story. Admirable goals, Lux. I'm thankful for God's forgiveness, grace, and healing when we fall short. True that... I'm going to be strong for my kids and never lose faith ! these are all great tips on how to treat kids! These are valuable things to avoid doing when it comes to raising kids. I may not be a perfect mother, but I do certainly try my best to raise them to the best of my ability. I do call on God's help and guidance daily! I'm glad you shared these things on the #SmallVictoriesSundayLinkUp. I look forward to seeing your posts next week. And I would add another - cut yourself some slack if sometimes you fail. All of us say things we wish we hadn't. It is part of what makes us human. On those days, breathe, apologise - and forgive yourself. Great words, your posts are always so Interesting Lux!!! No, no, no definitely not. I think the best that you could share to your child is your faith, i think that sums up everything because of that, we learn to tell them to strive, control, respect and be humble, from there, your child's gonna be a good kid. Also, you having faith in our Lord plus those things that you won't do (my fave is that, you wont keep him from the reality of this world) would make you a great mom! you are going to be an amazing mother!! This is a great list but remember you are only human. So dont beat yourself up too much if you fail occasionally. parenting is not an exact science. i don't have children but these are great tips and useful to read for anyone ... bravo! These are all great points. I pray to God everyday to guide me on how to raise my daughter. We live in an evil world and only the wisdom of God can help you through. I don't have children, either, but I do love children and I really like this list here, Lux! Good on you! Hugs. I definitely agree with all your points! I'm not sure yet if I want any kinds, but if I would, this would definitely be my list too :) Also, never hit them! Nicely done. These points really resonated with me - especially #3. Glad I stopped by from Titus 2. All good things + great advice to keep in mind! I wouldn't do all these to my children either. One more thing - when they grow up, I'd treat them like adults, not like children anymore. Dear Lux, I found this to be an especially wonderful post and let me tell you why. Since February I have been volunteering once a week for several hours at one of our hospitals in Seattle. My assignment is in the NICU (Neonatal Intensive Care Unit) where newborn babies are cared for until they are ready to go home. They call me a “Cuddler” and my job is to hold and rock little babies when the nurses and/or parents are too busy or unavailable. Just holding a baby in your arms often quiets them when they are crying and unhappy. All of the babies in the NICU have some sort of health complication. 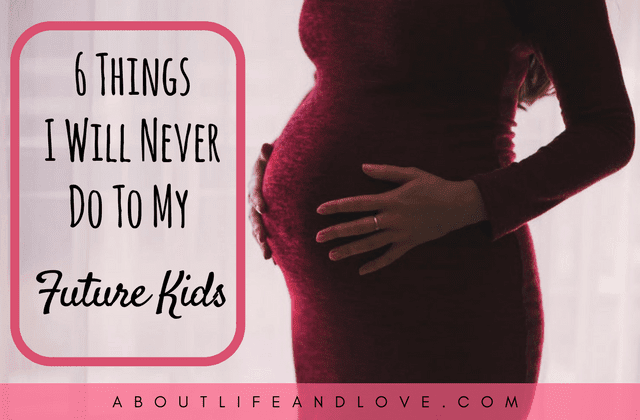 The 6 things you have listed in this post are exactly what I hope for my little ones. Blessings to you for sharing this. Wishing you a fine week ahead! From reading this, you will make a great mother. All of these tips I hold dear to my heart. as a mom of two amazing kids, I agree with everything you said here Lux. Right on. you're so wise! love your blog! Great post. Yeah, I would have to say my parents committed all six of these crimes but maybe I'm a stronger person because of it. Sound advice. It never fails to amaze me that some parents think its ok to publicly shame their kids. I love the part about not killing their dreams - it's true that kids think anything is possible - and it is as long as you believe it! What a great post. Absolutely agree about everything, especially #5 __ never shame them in public. I'm on board with all of these and definitely hope I do the same if/when I have kids.